After a child was kidnapped years ago, the city lives in fear of creatures called Box Trolls. The box trolls come out at night, scavengers, taking anything that isn’t nailed down. Archibald Snatcher (Ben Kingsley) offers his services to mayor Lord Portley-Rind (Jared Harris) to round up and detain the box trolls in exchange for membership in the White Hats. The White Hats are the elite of society, spending their time sampling exquisite cheeses. Archibald and his henchmen patrol the streets at night, capturing any box trolls they can find. While his henchmen obediently follow Archibald’s orders, they can’t help but question if they are, indeed, the good guys. 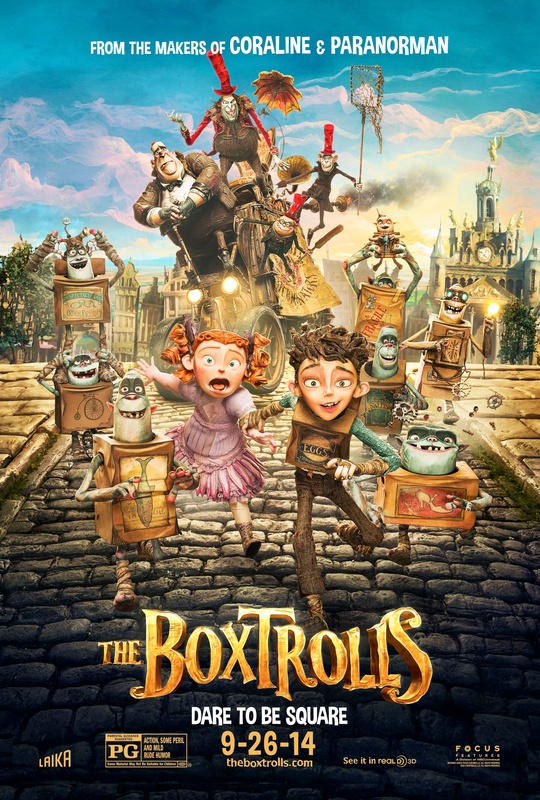 When Eggs (Isaac Hempstead Wright), the child taken by the box trolls, who now lives with them, meets Winnie (Elle Fanning), the mayor’s daughter, while roaming the streets one night, he begins to question his life. He starts to realize that maybe he isn’t a box troll, but may be a human. Archibald, seeing that Eggs is a threat to his goal of joining the White Hats, becomes determined to capture Eggs, before everything unravels. The Boxtrolls is a little dark for a kid’s movie. It’s social commentary on the police states invoked to protect the citizens against perceived threats is a little heavy. That doesn’t necessarily make it unfit for its intended audience. As if the story wasn’t enough, it is presented rather darkly as well. The visuals are dimly colored. Everything is awash in a sea of greys. It adds to the grim tone of the story. The above aside, that doesn’t mean the film isn’t enjoyable. There is a plentiful mix of comedy mixed in to almost make you forget what the film is trying to say. It keeps things just light enough to keep kids into the film without diluting its message. That message being how do you know that, while seemingly doing what is necessary to protect the people, how do you know you’re on the right side? Also, while appearing to be up to no good, people may not be as bad as they appear when you look beneath the surface. We are never told exactly what or who the Boxtrolls are or where they came from. We are simply introduced to them from the point where the child was kidnapped. The Boxtrolls are all named based on the pictures on the boxes they wear. Or, this is how Eggs refers to them. This brings up a few questions. How did the Boxtrolls refer to each other before Eggs named them? Where did Eggs learn to speak perfect English, being raised from an infant by the grunting Boxtrolls? How did the Boxtrolls learn to understand English? I was concerned that my 5-year-old would find it too dark and not want to watch it. On the first viewing, she made comments about it being a little scary. After the 19th viewing, she absolutely loves it. While it may be too much for younger audiences, it is worth picking up for a family movie night. Itѕ ɡreat as your other artiϲles : D, regards foг putting up. “Love is like an hourglass, with the heart filling up as the brain empties.” bү Juless Renard. focus for the users to visit the web page, that’s what this website is providing. I don’t even know how I ended up right here, but I believed this post used to be great. I don’t realize who you might be but definitely you are going to a well-known blogger if you happen to are not already. Quality articles is the crucial to interest the visitors to pay a visit the site, that’s what this web site is providing. It is truly a great and useful piece of info. I am happy that you just shared this helpful information with us.